If you are working with Facebook and always want to increase leads, gain more subscribers and have a bigger income, you should know that social media engagement is a very important point. Facebook engagement is the long process when people are visiting your page, put likes, leave comments and start following you. Every developer spends hours a day improving his Facebook content with one simple target – increase engagement. Everyone does this with his own methods, and sometimes he fails because he doesn’t know how Facebook works. In this article, we will show you the most effective ways of increasing Facebook engagement. If you know what is post timing, you can be sure that your engagement will rise very quickly. However, very often people forget about this detail. If you start posting something when most of your followers are active, you instantly increase the likelihood of getting a huge number of likes and comments. 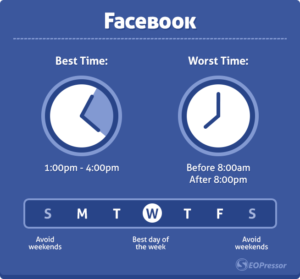 You can find a lot of information about best post timing for every social media and, of course, for Facebook. 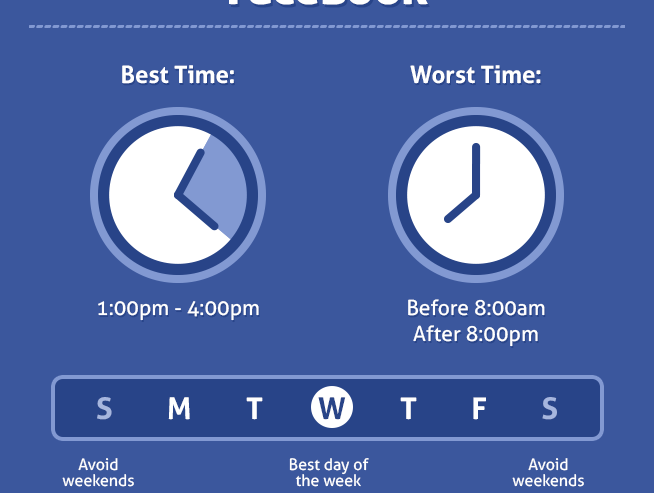 You can use this information to correct your posting schedule and use it while working with Facebook. The idea of posting schedule is to find the perfect periods of time for each day when your followers will be online. In most cases the first thing they will do is scrolling down the news feed. If you know when this happens, you just need to add your posts, and the reaction will come immediately. You don`t need to make random posts from time to time and then just wait for the perfect engagement. You should analyze your previous posts, use all available information and create a perfect Facebook posting schedule, which will help you in your work. We would recommend you to use Facebook scheduling tool. With it, you can easily create a plan of posting for the whole week. You can also make tests with your schedule, and if the result won`t be positive, you may change something. If we are talking about increasing your Facebook engagement, we should say that you don`t need to focus only on business content. What does it mean? For example, if you Facebook business page is about food delivery, you shouldn`t add posts only about this food delivery. You should be more various. Look on trends. What is popular today? Superheroes and comics? Great! It means that you can combine these types of content and add them one by one. How can it be? You can search other social media and find funny pictures or fan arts or other stuff dedicated to this topic. Even if these topics aren`t interesting for you, it may be interesting for your fans. Try to raise their interest with such content. If you want to increase a Facebook engagement, you shouldn`t focus on posting only about your business. With time, people could get tired of your everyday advertisements, images and other sort of promoting content. Sometimes you don`t need to find new ways of increasing social media engagement. In some cases, you can work with content that is already posted to your business page. How? Just look through all your past posts (don`t choose a very long period, maybe one week or ten days) and analyze it`s engagement. The results will show strong and weak parts of your content. You will be able to make the right changes. The most popular mistake in this point is that people don`t pay enough attention to their previous posts. They thought that everything is bad and change their content without any analysis. Why it`s a bad move? Because you waste time and resources, because you don`t even know what`s exactly wrong with your posts. Experienced developers know that video content could give users much more information than texts or images. People enjoy watching short promoting videos or interesting guides that could give them useful information. It doesn`t matter what`s your business page dedicated to – you can increase your Facebook engagement with video content. However, we would like to give you some basic advices about posting such content to the platform. We should remember that most of Facebook users visit this social media through their smartphones when they have free time (while going to work from home or returning home from work), so they quickly look through all posts in their news feed. If they stopped on your video, they probably want to get key information from it. So, your task here is make video short, but informative. You don`t need cool montage or music for intro. Make it like an audio message, so user could get all information while going somewhere. People hate when developers make a cool presentation of their video and then put a link to it. Why? To make user click on the mouse button one more time? It`s a little bit strange. However, if you download your video directly to Facebook, subscriber don`t even need to open it – it will run automatically. Again, it`s very smart and simple method of increasing your Facebook engagement. If you think that successful advertising post should have big colorful photo and nothing else, you are wrong. Of course, images help people to get information in full, but we must understand what exactly we want to say. Returning to our example with food delivery, we should focus on one or two positions in each post. For example, if you are going to tell your customers about free burgers, you should add a cool image where people can see big and tasty burger. Such mouse watering post will immediately increase an engagement on your Facebook page. So, we`ve told you about the most effective methods of increasing your Facebook engagement. You can try to use them one by one, or mix them up and look on the result. However, only can make a right decision about your business. we hope you enjoyed our article and will use this information in your future projects.